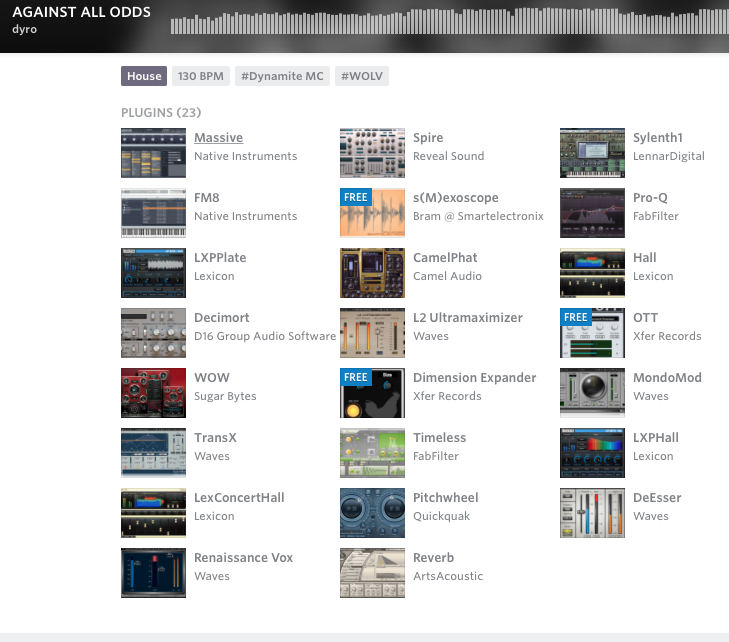 Dyro states, in [this](https://splice.com/dyro/against-all-odds) Splice project, that Xfer Records OTT is among the plugins he used. Martijn: ""[Laughs] I secretly use the OTT [Xfer's freeware compressor] but Nik and Thijs don't really approve of the way I use it! " At 25:18 we can see the Xfer OTT plugins, used by Virtual Riot in this tutorial. In this Instagram pic we can see OTT Multiband Compressor. The item can be seen 14:40 into this video. KSHMR's tips on how to make sounds in your mix sound fuller: - The kick should have a nice attack on the top end as well as the low. It may help to add a clap (with the lows and mids cut out and a fair amount of reverb) on top of every kick - Putting groups of the synths on a bus (e.g. main synths, bass synths, etc), or a simply grouping them as with [ableton](http://equipboard.com/items/ableton-live-9), and then compressing and eq'ing that group helps as well - There are plug ins such as OTT and [FabFilter's Pro G](http://equipboard.com/pros/kshmr/fabfilter-pro-g-gate-expander-plugin) which can help to make synths sound bigger using upward compression Original source [www.welcometokshmr.com](http://www.welcometokshmr.com/). In an interview with Sonic Academy Pierce describes the Xfer Records OTT Multiband Compression Plugin, "...you can throw it on a bassline... its very subtle but it works really well... He then talks about the plugins features and how he used it in his Dadalife remix. In this Instagram photo, you can see that OTT is in the left part of the screen. the Xfer Records OTT Multiband Compressor Plugin can be seen 1:59 into this video. A plugin in the mixer named OTT, as seen in Gazzo's Facebook photo. In the video you can see in te second 0:20 he is using the OTT. This plugin can be seen at 23:01. At 1:26 in the video; B3nte lists the Xfer OTT as the compressor he uses on his vocal leads. If you look closely at the side of the playlist of FL Studio, There is an instance of Xfer OTT. Always put OTT in your projects guys. This compressor is perfect for when you need to compress the crap out of something, but as the name suggests, it's pretty all-or-nothing. Pro tip: slap it on a piano to make it sound twinkly like the piano in Skrillex's song First of the Year (Equinox). Great for throwing on Basses and Piano from what I've learnt. This is one of my favorite plugins. This is a great plugin for beefing up your sound. I love Xfer plugins and this is another lovely plugin when i need multiband compress OTT saves me. Simple but very effective !! Free must have !! Can give my synths a very spacey vibe. Good for wanting atmosphere. One of the compressor plugins JONTEI uses. If you want that quality taste of music, you're looking at one of the secret ingredients. Nice Multiband Compressor! Nice OTT Tool! I love how simple OTT is to use. It can really improve your sound. Just a pinch goes a long way. Thank you Steve Duda! This is a great compressor that was given to me as a gift from a buddy. Simple but it can get the job done. this is the best plugin for compression stuffs! I use this to fatten my 808s to Bring out the BANG! Great tool to get some wacky leads going.